Fitzpatrick, Leary & Szarko, LLC has been established on a foundation of more than 70 years of combined professional experience providing guidance and counsel to clients. The firm’s members have extensive experience and are highly recognized in the business community for their expertise in providing accounting, assurance, tax and other consulting services. Zest worked to create a design that reinforced their brand ideals but was also fresh and new. The Fitzpatrick, Leary & Szarko logo was created out of inspiration from the Loch Raven Reservoir which is a local landmark for their area. There are three logo variations that are all used throughout print and digital marketing collateral: Full, Short, and Thumbnail. The standard logo color is full black, but when possible, the brand green is used. Zest created a Letterhead design incorporating Fitzpatrick, Leary & Szarko branding elements to be used for both client communication and internal work. 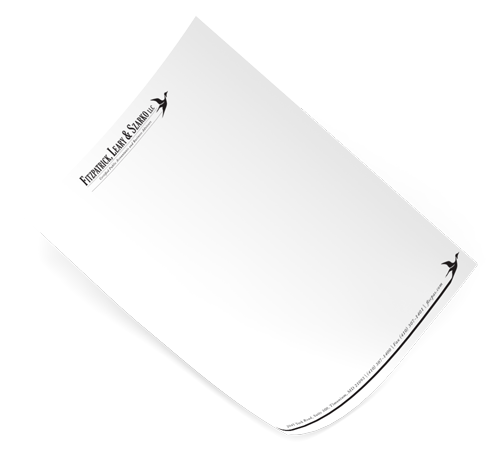 The Letterhead was created in two different formats: PDF, which was printed on high quality stock card for hard copy communications, & Word, which was primarily created for internal or digital use. Zest built this site from the ground up, starting with a wireframe of the site design. Once the bones were in place, each section was filled with graphical elements and content to develop the site and the design further. Just like an architect, website blueprints are essential to create the best end product possible. Fitzpatrick, Leary & Szarko's site uses both a primary and secondary brand color. The lighter, secondary, color can be see as an accent in the heading of each section as well as in the hover and active states. Similarly, the typography and character stylization also incorporates various styles across the site. The typography used throughout the website is a clean, modern sans serif named, Usual, while the character stylization uses different weights and uppercase to create hierarchy throughout the content without overpowering the message. The Fitzpatrick, Leary & Szarko uses modules, which are bite-sized pieces content, to give the user a preview of the full information available to them on the corresponding Inner Page. The background of each section features nature-themed images which reflect the natural quality of their logo and the Loch raven Reservoir. On the home page, each preview section highlights the key points about that page. The Services module is perfect for showcasing Fitzpatrick, Leary & Szarko's four main services: Tax Compliance & Planning, Audit & Accounting, Outsourced CFO & Bookkeeping, and Consulting & Other Advisory. A content slider allow for a brief description of each service and the option for the user to find out more information, by way of a "Learn More" button. The Fitzpatrick, Leary & Szarko Inner Pages are the heart of the site. The content displayed on the Inner Pages, is everything a user would ever need to know about the company. Each Inner Page clearly illustrates its purpose through the content, while maintaining the branding by use of typography, images, and color. The Contact module featured on the Home Page carries through all Inner Pages to create easy access for the user. Zest worked to created a site which gave the user an easy and sleek experience to ensure that the site looks, feels and responds on a mobile device or tablet in the same way as it would on a computer. 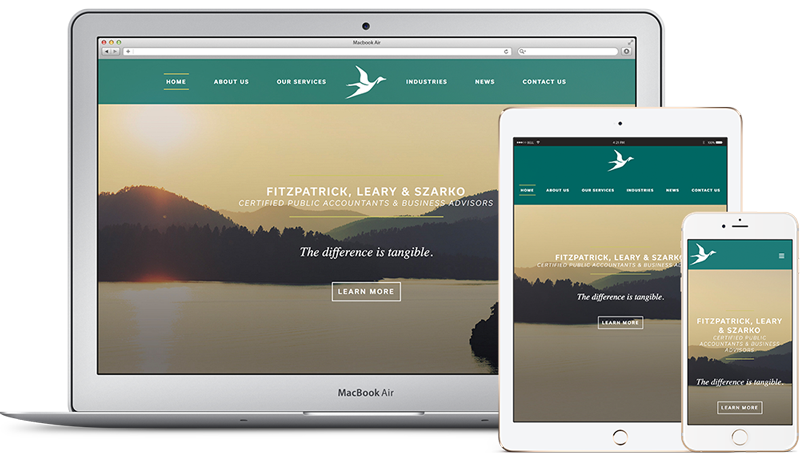 The Fitzpatrick, Leary & Szarko website features three different main navigation designs which appear in response to the user's device. The modules and content throughout the website stack when the viewing area is scaled down. Zest writes monthly articles for Fitzpatrick, Leary & Szarko to give their customers new ways to learn from and interact with the company. 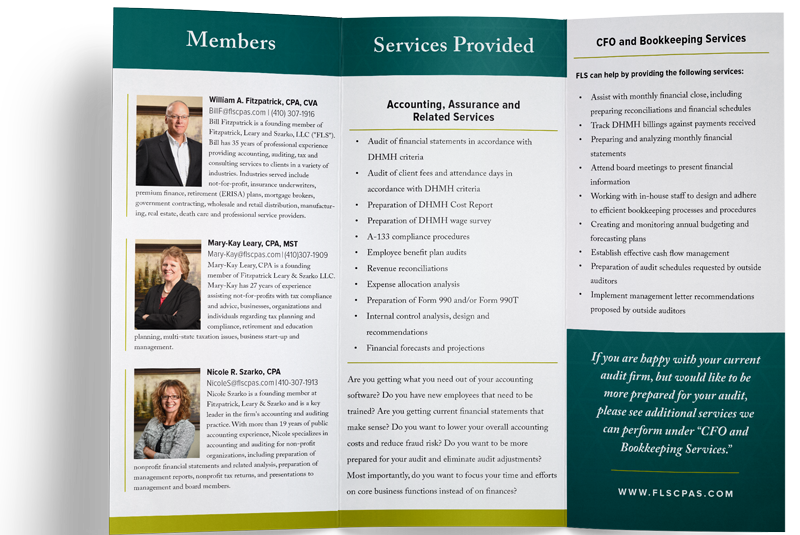 In addition to developing a branded website and digital collateral, Zest also works with Fitzpatrick, Leary & Szarko to create printed materials. Zest has created a full library of Trifold Brochures for different event, topics, and featured content over the years we have worked with FLS. Other print collateral created includes Postcard Mailers, White Pages, and Ads.